My Mother always cooked exceptionally great food with few ingredients, and her Very Simplistic Bread Pudding was no exception. Growing up, I never thought of this dessert as a no frills dessert, just a delicious comfort food. While French Toast and Bread Pudding at our house was a way to use up stale bread. There were times you would find my Mother laying sliced bread on a baking sheet to dry out, and you knew what was coming. There is one rule with my Bread Pudding, no raisins. Mother didn't put them in hers, and I don't put them in mine. One of her secrets to a rich, creamy Bread Pudding, was when she took it out of the oven, she would pour melted butter all over the top, and we couldn't wait to dig in. I still can't decide if I like my Bread Pudding best served hot or cold. It's one of those things where, if I am eating it hot, I like it best hot, and when I am eating it cold, I like it best cold. You know how that is. I just know it is delicious! I have found that it is best to cut back on the sugar if I am going to serve it with a sauce. Not very often, but sometimes Mother would serve her Bread Pudding with ice cream. 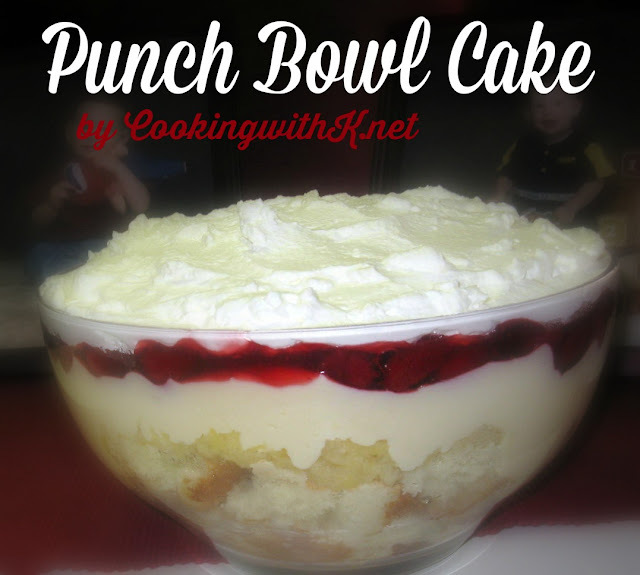 I loved that my Mother knew---- The most simplistic of desserts are comfort food at it's Best! Preheat oven to 350 degrees F. Using the stick of butter, butter a 9 x 12 baking dish and spread the bread cubes evenly in the bottom; set aside. Reserve the rest of the stick of butter for later use. In a large bowl, mix together evaporated milk, 1 cup of whole milk, sugar, eggs, and vanilla until eggs are completely mixed in. Add cinnamon and nutmeg and mix well and immediately pour over bread; let set 5-10 minutes, pressing down occasionally. Pour additional milk over the bread if the bread is too dry. Bake in the oven for 35-45 minutes until bubbly and golden brown and a toothpick comes out clean. Melt the rest of the stick of butter that was used to buttered the dish and pour evenly over the hot pudding as soon as it comes out of the oven. Serve warm or cold and if you like top with a sauce of your choosing. Note: There is a delicious Vanilla Sauce Recipe over at The Daily Smash. 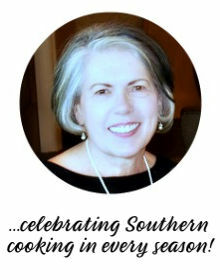 Check out her yummy recipes--you will not be disappointed! Join CWK for Weekend Potluck, Freedom Fridays and all these fabulous parties! 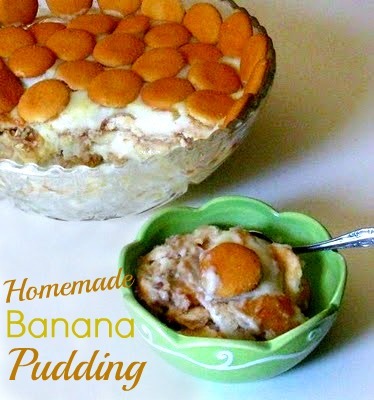 My hubby loves bread pudding so I will definately try this on. Thanks for sharing it. Oh my gosh, melted butter all over that, wow. Your granny sure knows her bread pudding! This looks divine! I love the thought of pouring melted butter on top once it's cooked. There is a fabulous restaurant in Prescott, AZ., Murphy's and also The Grill both owned by the same owner and they had a bread pudding that was to die for. My daughter worked there as a hostess and she would bring me generous pieces from time to time. I know theirs had a whiskey or rum in i as well as a drizzle of icing...yummy! I just put on five pounds thinking about it! I have never had bread pudding. Looks delicious. Thanks for sharing your recipe. Bread pudding has such happy memories for me--my sweet grandma would make it a lot growing up! Thanks for sharing--it looks very delicious! I hear you, K, on the no raisins rule. I'm not a fan either. Not that there's anything wrong with them...This bread pudding looks and sounds delicious! Thanks for sharing on Sweet Indulgences Sunday. My mother was also a great cook. It is odd, today my sister and I ate a tea room. For our sweet tooth, we got bread pudding. thanks again for sharing this over at Food Friday, K! Yum! I agree, no raisins :) Thanks for sharing at Church Supper. Hope to see you again next week. I do love bread pudding. I like chopped pecans and maybe a few fresh blueberries, oh and a yummy sauce. Sounds like dessert tonight. I could use some to have with my coffee, right now. You do have wonderful recipes. I love, love, LOVE bread pudding! Your grandmother's recipe looks and sounds sooo yummy! It looks very similar to mine...if not the same! I'll have to go and check! 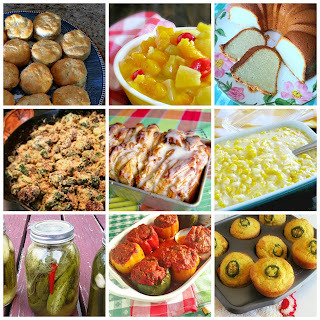 Thank you so much for sharing your yummy recipe with us for the Sunday Favorites repost party this week! What a treat!!! I love bread pudding but I've only made it once and it didn't turn out. I'm going to have to try this. 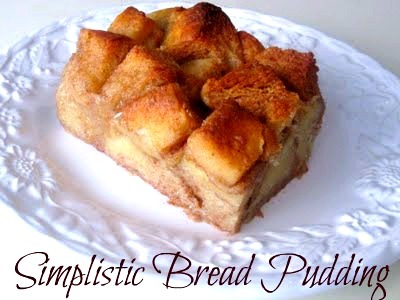 Looks delicious, I have been searching for a simple bread pudding recipe. Thank you! I definitely love bread pudding...enough that I used leftover baguettes from my daughter’s birthday party to make a savory bread pudding for dinner the other night! I’ll definitely be pinning this recipe for later. Thanks for sharing such a special recipe! Lovely recipe. My kids love it totally. Thanks for sharing. We love bread pudding too! My hubby even has been known to make it... gotta love a guy that can cook!!!!!!!! Mmmmm. Now I want bread pudding dang it! Hello - I'm your newest follower from the Welcome Wednesday Blog Hop. Please follow me back and feel free to drop by anytime. I love bread pudding but haven't made it. You have made this looks simple and good. But my rule is --always add raisins! Thanks so much for linking this project to my Pinning & Singing Pinterest Party! I love bread pudding and am always looking for ways to change it up a bit. I do tend to add raisins though! Love the bread pudding recipe! I have a Jack Daniels bread pudding recipe I need to try! loks great! What a delicious comfort food! I have never had bread pudding, but I can see that I need to change that fact very soon. Thank you for sharing your delicious recipe with the Hearth and Soul Hop. BTW, I may have missed it, but I didn't see a link to one of the Hearth and Soul Hop hosts. Would you mind adding a link to one of the hosts? I'm so glad you shared this! I really love a good bread pudding and this sounds delish. Do you have a recipe for the sauce? I already have part of a loaf of french bread in the freezer so when I have enough bread, will definitely try this! Mums do know best, and this recipe looks easy and decadent! Just Lovely, and no raisins..just how it should be. I've never tried pouring hot melted butter on it after it's come our of the oven. I usually pour over a hot chocolate sauce.Yummo! My aunt could make the best bread pudding ever! I've tried and tried to duplicate her way with absolutely no success. Top this luscious dessert off with frozen yogurt and you have a treat fit for a king. We love bread pudding, but we make it with raisins sometimes and without other times. I love it any way I can get it, especially with a mug of coffee! :) Visiting from Friday Potluck! I would love it if you stopped by my blog to say hi! 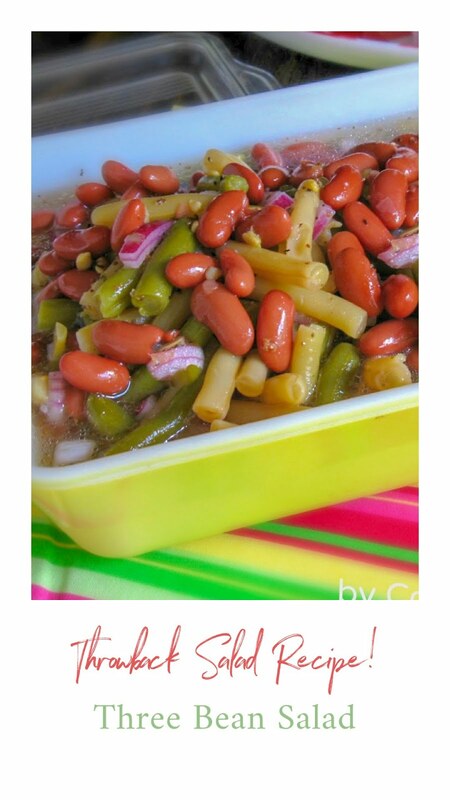 Very nice recipe!! I love any type of bread pudding. Yours looks soooo good. I linked to you from Friday Favorites. Can't wait to make this! I like bread pudding, although I have never made it at home myself. Thanks for linking up to Fat Camp Friday! See you next time. Your Bread Pudding looks delicious. I can almost taste it right now, yummy! Hope you are having a great week end and thank you so much for sharing with Full Plate Thursday. Thank you for linking up to Bacon Time. I love bread pudding and will be featuring your post on Thursday afternoon. Thanks again for sharing and hope to see you each week. I made this and my family loved it. I added one element once it was finished baking. I added cinnamon sugar and put it under the broiler for 2 minutes. I used the sauce recipe recommended. It was amazing. Rave reviews from everyone. Thanks for sharing. Thank you for stopping by and letting me know how much y'all enjoyed it. I like your touch on on broiling the cinnamon sugar…have to give it a try! You are so welcome Carrie...so happy you stopped by! 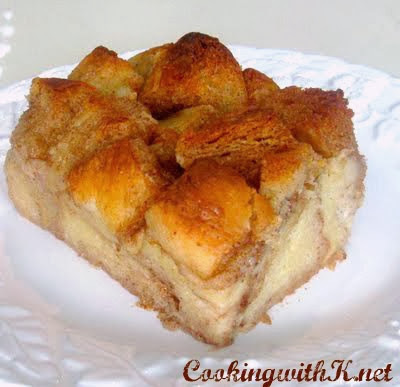 I love bread pudding but have never made it. I never thought you could use hot dog buns. We seem to always have some that end up getting made into bread crumbs because I never knew what else to do with them. Next time I have some I am making bread pudding! !